Ceramic tiles have been used for thousands of years, some dating back to 500 BC in Mesopotamia. 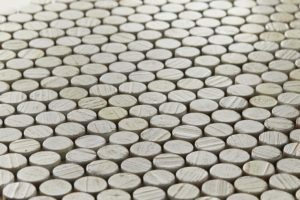 Ceramic tiles created from from organic materials like clay, sand, stone and water and then shaped into tile and baked in a kiln. With thousands of factories creating tiles world, it’s hard to catch attention in this field without doing something special and unique. 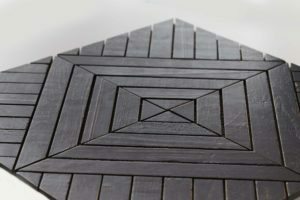 In 2015, Indoteak Design set out to create a new product offering that would be a good accompaniment to their to their already incredible list of items. 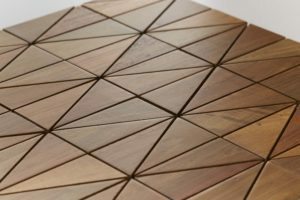 Indoteak Design Owner, Frank Ragen, partnered with brands Walker Zanger and designer Erin Adams to create the Cintá and the Anteak Collections. 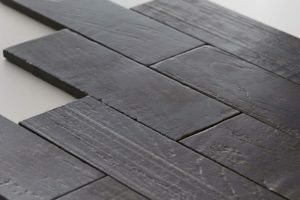 The difference from other brands is that these tiles are all created out of 100% FSC reclaimed teak wood. The beauty of traditional tile patterns shine through with an added story of reclamation and zero waste. All of the wood used by Indoteak Design is utilized from old growth timbers that were saved from destruction. During the manufacturing process, ALL the wood is used. The biggest pieces become flooring, siding and decking. The remaining smaller pieces become substrate, tile, wood filler and even the dust is used to fire the kilns. It’s truly an amazing process. 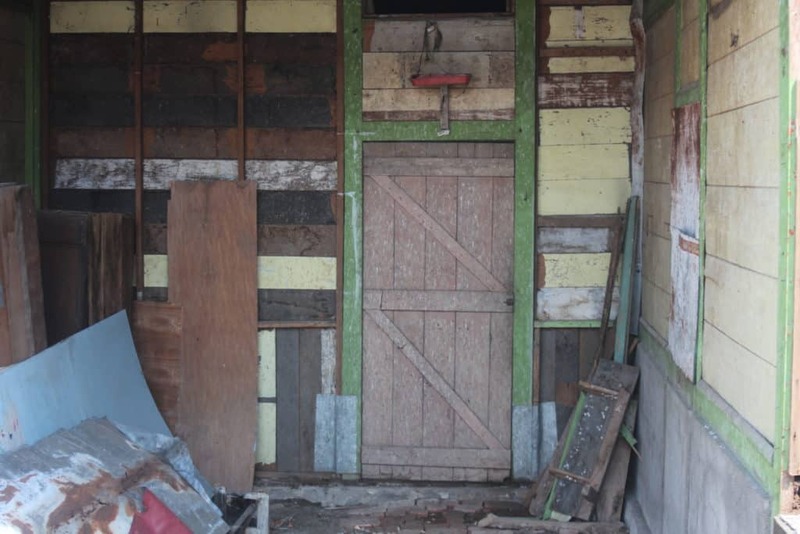 The unique wood is acquired when buildings are slated for demolition due to being unsafe or torn down for new buildings to go up. These old structures are often hundreds of years old, the wood from which they were built was harvested from old growth teak trees 200-500 years in age. That old growth is impossible to find today. 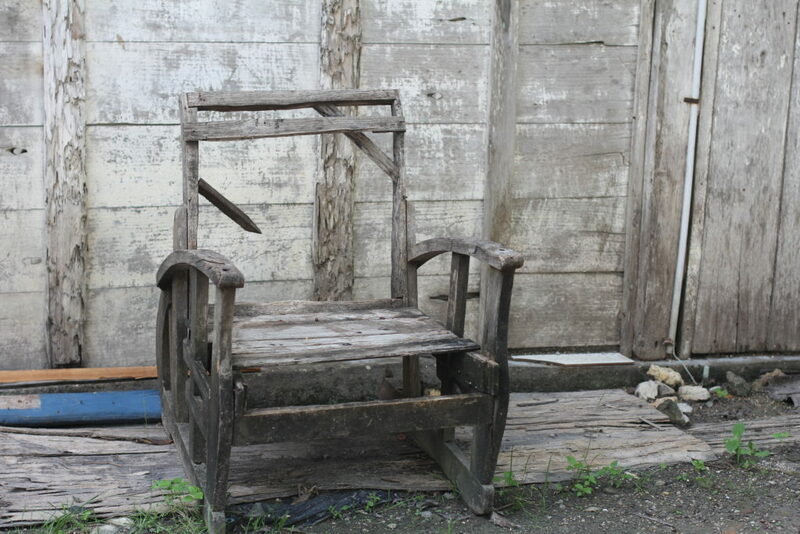 The patinas created from centuries of weather & wear have made the wood straight, hard and simple gorgeous. 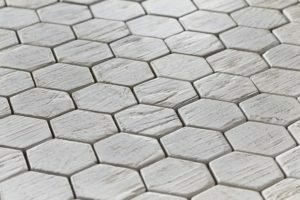 From the Cinta collection- The “Amy” Tile in white resin. 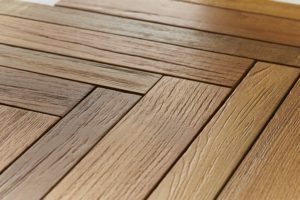 Perfect for any wet area as the wood tile is completely water proof. 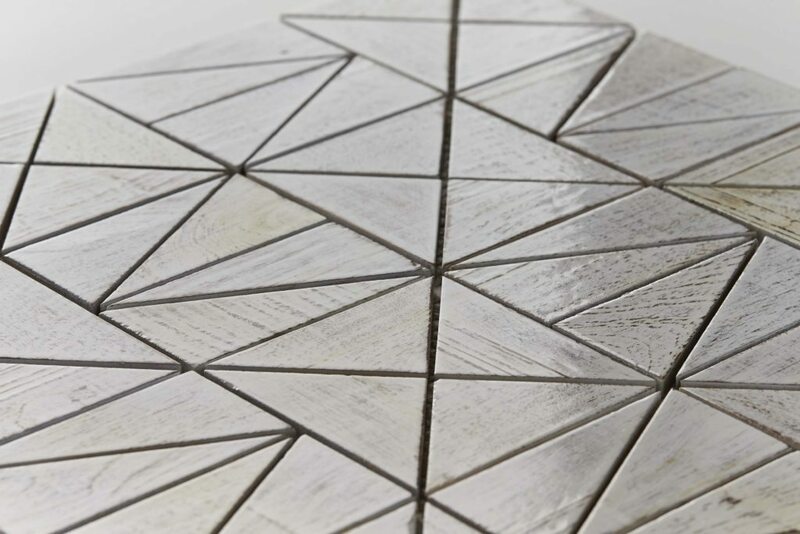 The Cinta collection (Cinta means love in Indonesia) was created by Erin Adams and Frank Ragen and each tile design is named after Frank and his family. After years of traveling to Bali for waves and relaxation, Frank fell in love with the people and the country. Frank was building a custom home and was searching out teak wood for the project. Frank found his wood source, and soon became enthralled with the beauty of what he was creating. He also had people asking where to buy the products he was installing into his home. 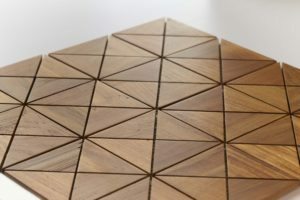 It was at that moment he ventured onto a new path and decided to start Indoteak Design.Since that time, the product line has grown but its the reclaimed teak tiles that are always the show stopper. 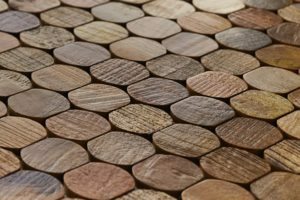 With immaculate designs, earth friendly creativity and the story of reclaiming the ancient teak, Indoteak Design has created something that stands alone in the world of interior design. Indoteak Design gets its reclaimed wood from old structures that are slated to be torn down or destroyed. Instead of letting the wood end up in the landfill, we buy it and restore it into our line of products. 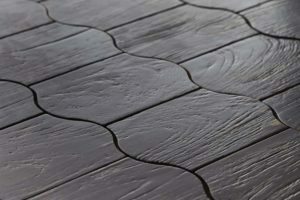 All the tiles in the line are available in any color the customer can dream up. With the full use of the Sherwin Williams color palate, Indoteak Design can make anything their clients can dream up. From bright and fun designs, to subtle and elegant hand-rubbed oil finishes. 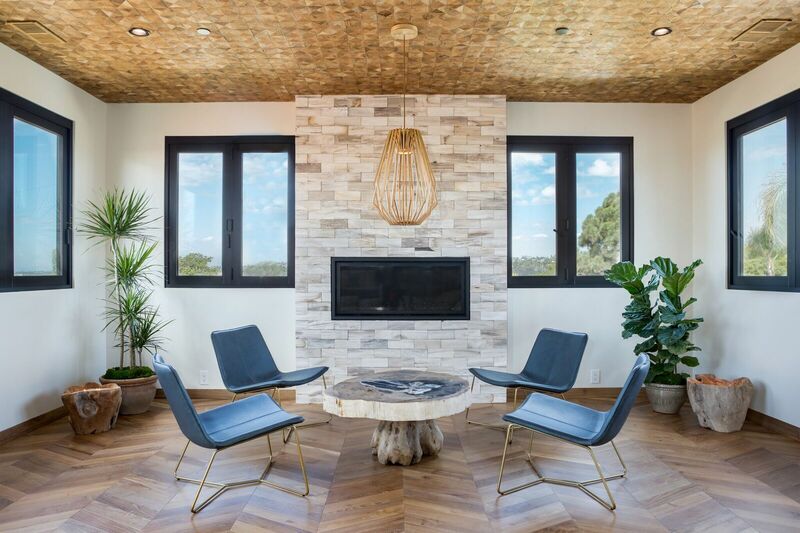 In 2018, Indoteak Design introduced their Cinta Seamless Tile collection called the “Max” and “Cordelia” – These tiles are created to be used for walls and ceilings and need no grout to be mounted. DIY enthusiasts will love the ease of installation with the use of nails or adhesive to make quick work of weekend room remodels. Click on the images below to learn more or order samples. A first of its kind. 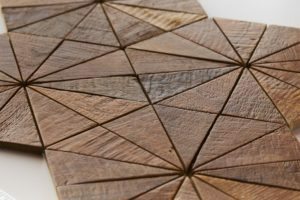 Our solid, beautifully crafted FSC recycled 100% reclaimed teak tile is the perfect addition to any indoor or outdoor space. With ease of installation, it’s perfect for bathrooms, kitchens, back-splash, entry-ways or any wet environment like saunas, pool areas and gyms. Teaks luxurious look and feel is perfect for any home, business or hospitality project. All tiles are available in custom colors. The oldest Child of Frank and Amy. Emma has her own unique take and opinions regarding all things teenagers care about. A young actor and singer, Emma looks at things with a discerning eye and can be brutally honest at times. It’s that strength that lead Frank to name this selection after his only daughter. The owner of IndoTeak Design and patriarch of his family. Frank started IndoTeak after taking a surf trip to Bali after Grad School. He soon fell in love with the surf, the people and the beauty of the island nation. As he ventured back to visit more and more, he eventually wanted to make his new home with the vibe of Indonesia. That’s when he discovered the gorgeous reclaimed teak that would change his path in life. This selection shows strength, re-creation and restored beauty, summing up Frank as well as the gorgeous reclaimed teak used for these tiles. The youngest child of Frank and Amy. Taylor is all energy and possesses the wonderment we all wish we once had from our youthful days. His non-stop drive to keep up with his older siblings reminds us all that sometimes we need to fight to be seen and have our needs met. That place as the youngest and smallest also creates big personalities with a robust sense of style. The Taylor Cinta selection reflects that tenacity and creativeness that gets noticed. Named after Franks wife and quarterback of their busy family. This Cinta Tile offering lives up to Amy’s name by being tough, classy and able to handle anything life can throw its way. Colors and finishes depend on your style, needs and taste. 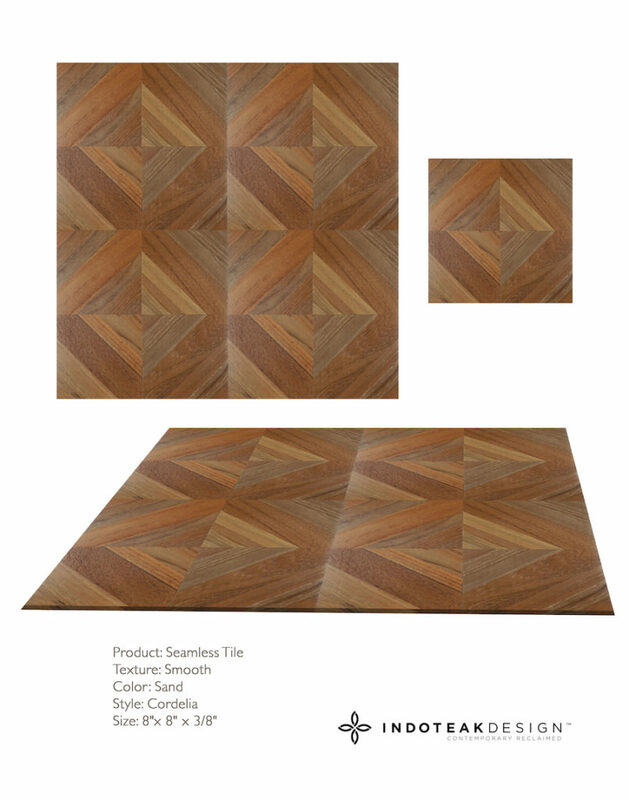 With many colors to choose from, this was the tile selected to be used by Whole Foods in their latest store facades. Tommy or “Tom Tom” as he is called, is the family’s musical prodigy. Even though he is only 9 years old, Tommy is releasing his first album and heading to New York to star in musical “School of Rock” as it tours around the country for 2018. Wise beyond his years, an “old soul” if you will, Tommy’s Cinta tile reflects the blending of something old and something refreshingly new. A first of its kind. Our solid, beautifully crafted FSC recycled 100% reclaimed teak tile is the perfect addition to any indoor or outdoor space. With ease of installation, it’s perfect for bathrooms, kitchens, back-splash, entry-ways or any wet environment like saunas, pool areas and gyms. Teaks luxurious look and feel is perfect for any home, business or hospitality project. All tiles are available in custom colors. 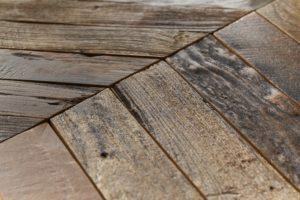 The Modern classic collection was developed to showcase classic styles of tile patterns with the modern look and feel of the reclaimed teak wood. 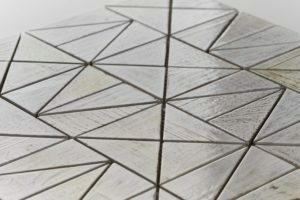 The results are a stunning glimpse of classic designs reimagined in sustainable material.